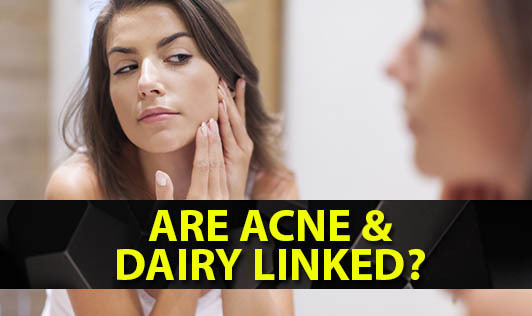 Are Acne & Dairy Linked? Although we would like to believe chocolates cause acne, it's not scientifically true. Similarly, some people blame dairy milk as a cause for acne. Vegans (those who do not consume any animal products, including dairy foods) promote this belief. But is it true? There might be anecdotal evidence on the link between acne and cow's milk consumption but research has not yet proven it. Those allergic to dairy milk might get skin problems but this does not mean milk is harmful to all. However, if you suffer from acne and strongly believe that cow's milk is the cause, avoid milk for a month and see if it helps to reduce acne. If yes, that's great. If not, you're on the wrong track. Those of you who avoid milk, be sure to include other foods to replace the nutrients from milk. Soymilk, tofu, green leafy vegetables, nuts, fish, meat, etc should form a part of your diet. Check with the dietitian on what would suit you best.